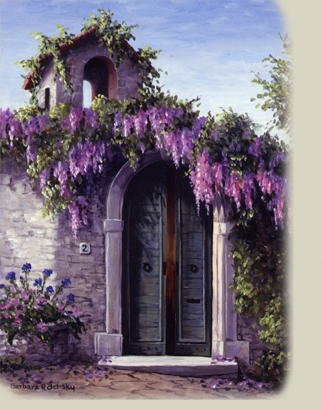 Barbara Rosbe Felisky is known for rich impressionist paintings of gardens and landscapes. The afternoon sun warming a wall in Provence, an embankment of towering rhododendrons spilling into the moat of a ruined castle, or a glorious profusion of roses climbing over a brick garden gate, all impart a sense of tranquility and awe in an all-too-often hectic world. Travel is an important facet of Felisky's life. Her frequent trips provide inspiration and source material for her images of Provence, Tuscany, the Amalfi Coast, Italy's Lake District, California vineyards, and, of course, English gardens. Each year she seeks out a new area to explore and photograph, returning to the studio revitalized and refreshed. However, England, with the pull of its scenery and gardens, still holds a special fascination. Felisky's rich palette and vibrant colors capture the exhilarating hues of the flowers and shrubs, while the stone walls, bridges, garden pools, and paths draw the viewer deep into the quiet tranquility of the English countryside. As a change of pace, she often paints florals and still-life tableaus of familiar and folksy home and garden objects. Born in Chicago, Illinois, Felisky now resides in Southern California, painting daily at her studio. She received a Bachelor of Arts degree in Art and Education from the University of Michigan at Ann Arbor. In order to further develop her skills, Felisky studied oil painting with a number of California artists as well as drawing under Fredrick Odell. Using the knowledge she acquired during her university education and while working as a professional artist, Felisky taught classes in drawing and oil painting to school-age and adult students. Her time is now spent on traveling and creating new images to satisfy her devoted collectors, new and old. Felisky, whose biography appears in Who's Who In American Art, has also been featured in American Artist magazine on a number of occasions. Her own article "Searching for Levitan" appeared in the July 1988 issue of that magazine. Her work has been shown in a number of major juried exhibitions and featured in many gallery shows.